At this time, I bought a LED bulb, 9.9 rmb in Guangzhou IKEA, less than $1.5, including 17% tax!! One of the IKEA LED bulbs characteristic is that whey are similar with the traditional incandescent bulb. When turning it on, you can find the light alternating with dark, it is not so obvious. But better than the IKEA LEDARE 600lm 8.3 W and IKEA LEDARE 400 lm 6.3 W. Someone may say it is not the good way to test the flicker, yeah it is right, but for the consumer, it is the best way to do. Testing with some electrical equipments, be careful with that electric shock. This teardown involves removing the bulb’s cover and, Lamp base, working with exposed broken glass. Wear eye protection and work carefully. The bulbs contain 2 LEDs, but they aren’t worth making mistakes or taking shortcuts and injuring yourself. The worked for me, but you are on your own for this teardown! Package looks the same! But can you find the Chemical warming? For this RYET LED bulb, the chemical Warning table is wrote on the back side of the package sheet. Is it confused? Anything they want to hide? Marking Label, the Power factor looks sad! It is less than 0.5. I am curious the same thing in the US and EU. The LED chip reach near 92 C in 10 mins. As the PCB is metal base. When testing the thermal test, touch the rim of the housing, you can feel energy, the plastic near the PCB is hotter than others. Go back to the LED chip, it is 3030 type, same as other IKEA LED bulb, they may buy form the same supplier. The E333645 is the file number for HUIZHOU LEAD TECHNOLOGY CO LTD, its address is 3#Plant Zhongjian Technology Park, 89 Lianfa Rd, Tongqiao Town, Huizhou, Guangdong 516032 CHINA. Model no is AL88, UL Certificated, 2016-01-19 is the manufactured time, V-0, 130 C. Here is the detail link. 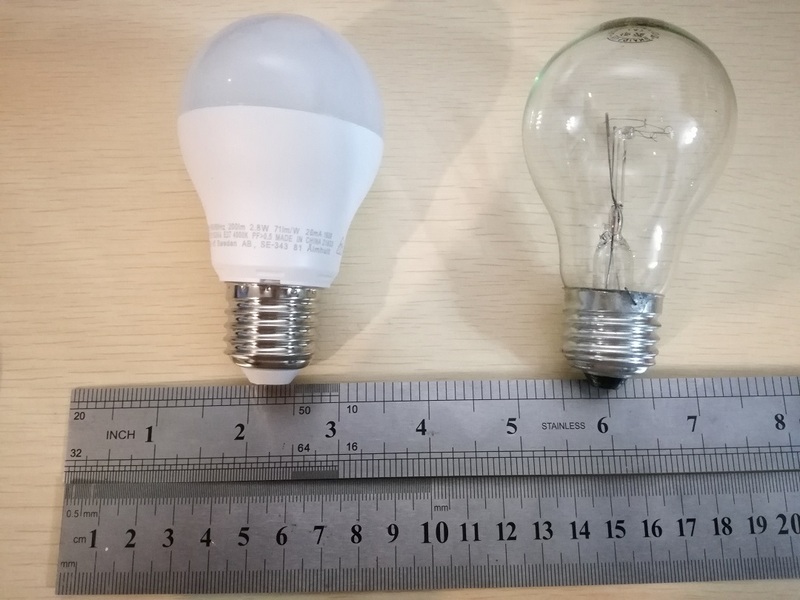 The housing’s temperature is not so high, but like other IKEA LED bulbs, thermal management is not very good. As the cost drop down, there is no metal part in this LED bulb, but would this construction kill the LED bulb in the future, shorter its life? Now, tear it down, what is behind the light? After with bit force, you can remove the White cover. The LED Chips are exposed in front of you. Once you see the connector on the board, 2 small pins over there, it is Convenient assembly. The LED board is secured to housing by snap-in, you can see the small parts near near the LED board. Testing the output voltage, it is so amazing 94.2 Vdc, no load voltage 245 Vdc. WOW! Why? I have no idea. With Cutting pliers, I carefully remove the E27 Lamp base, it is good for me, when you trying doing this, be careful. Once you remove the E27 lamp base, then push the LED driver form the housing easily. LED Driver is coming. There is only 14 electrical components which are mounted on the PCB of LED Driver. One fuse resistor, 2 leads, one e-cap, 2 inductors, 1 Bridge Rectifler(MBL 10S) and some SMD components. As the driver including the Pb, please keep away the kids!! Now, here is all different parts of this IKEA RYET LED bulb. It is less than $1.5 only. Would You want to buy it ?? ?